New Galion High School girls varsity basketball coach Nick Vukovich (center) talks with Lady Tigers Jaime Ehrman (left) and Robin Barnes during a shoot-around on Monday at GHS. Vukovich met with team parents for the first time on Monday and laid out plans for the rest of the summer. A positive vibe can lead to some good things. A negative vibe, well, you know. 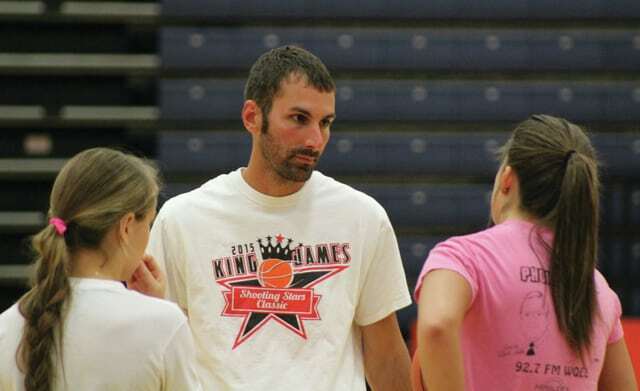 For Nick Vukovich, his first meeting with parents as head coach of the Galion High School girls basketball program definitely left him with a positive vibe. Vukovich, whose hiring was approved by the Galion City School District board of education on June 16, comes to Galion after two seasons as head coach at Ridgemont High School in Hardin County. He said he believes his biggest challenge early on will be building a bond of trust with the team. New Galion athletic director Kyle Baughn appears to have already bought into Vukovich. Vukovich’s first meeting with the Lady Tigers was June 23. The new coach said he’s been pleased with the attendance at workouts during his first week on the job. During the parents meeting on Monday, Vukovich took time to lay out his philosophy and approach to the game. One of his top priorities is helping the Lady Tigers improve their ball-handling skills and cut down on turnovers. Galion committed 544 turnovers in 2014-15, an average of nearly 25 per game. Vukovich said the Lady Tigers will be extremely busy in July between OHSAA-allowed coaching days, open gym sessions and shoot-arounds. Galion is also scheduled to attend a team camp at Adrian College in Michigan. While it’s a relatively short period of time for him as a new coach, Vukovich hopes his players will pick up his system and philosophy in quick fashion. Galion is scheduled to open the 2015-16 season on Nov. 20 with a home game against Mount Gilead. The Lady Tigers travel to Crestline on Nov. 21 and visit Highland on Nov. 24. The Mid Ohio Athletic Conference season begins on Nov. 27 with a home game against Buckeye Valley.